The 85 Defiant Class Near Coastal Patrol Vessels (NCPVs) will have a deadweight tonnage of 20t. Image: courtesy of Metal Shark. The 85 Defiant NCPV is based on the Damen Stan Patrol 2606 design. Image: courtesy of Damen Shipyards Group. The patrol vessels will be built at Metal Shark’s Franklin shipyard. Image: courtesy of Metal Shark. Metal Shark are developing the 85 Defiant Class Near Coastal Patrol Vessels (NCPVs) for the US partner nations. In June 2017, the Naval Sea Systems Command (NAVSEA) of the US Navy selected Metal Shark to build up to 13 of the 85ft NCPVs under a foreign military sales (FMS) contract. The FMS contract also includes the delivery of electro-optical infrared sensors, in-country reactivation, crew familiarisation and testing services. 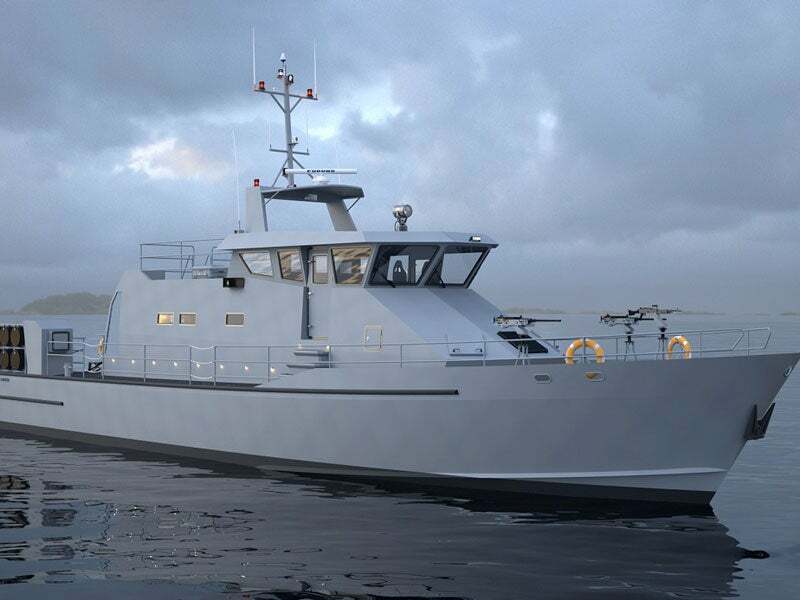 Metal Shark will be building the patrol vessels in its shipyard complex in Franklin, US, and will deliver them to the Dominican Republic, El Salvador, Honduras, Costa Rica, Guatemala, and other US allies. The NCPVs can be deployed in a range of missions, including search-and-rescue (SAR), maritime patrol, counter-narcotics and maritime security. The 85 Defiant NCPV is based on the Damen Stan Patrol 2606 platform. The base design has been enhanced by Metal Shark to achieve crew-friendly functionality. The all-welded aluminium vessel will integrate deep V-hull with raked bow, wide inverted chines and spray rails. It will offer superior durability and seakeeping, large payload capacity, and economical operations. The wheelhouse of the vessel will have pillarless glass and large spotter windows for high field of view. It will be fitted with openable side and aft pilothouse windows to enable crew communication during docking and manoeuvring beside another vessel. Its crew can access a surefooted passage to safely traverse between bow and stern. Non-skid walkways aboard the vessel will feature low-level LED lighting for operations during the night. The water-tight manholes and access hatches will allow the crew to enter tanks and machinery areas, while the vessel will also integrate stern ladders for accessing water. Each vessel will have a length of 26.5m, beam of 6.2m, depth of 3.3m, and maximum draught of 1.8m. The cargo-carrying capacity of the deck will be up to 4t, while the total deadweight of the vessel, including fuel, personnel, cargo and equipment, will be 20t. The vessel can also carry 55-gallon drums securely within ejection racks. The large aft deck of the vessel can house a 5.5m-long, ten-person rigid-hulled inflatable boat (RHIB). The integrated stern slipway aboard the vessel will enable the launch and recovery of the boat. "The NCPVs can be deployed in a range of missions, including search-and-rescue (SAR), maritime patrol, counter-narcotics and maritime security." Its modern crew-friendly design will offer comfortable accommodation for more than ten personnel to support missions at sea for extended time periods. The navigation and communication equipment aboard the vessel will include a gyro compass, radar, an echo sounder, a speed log, very high frequency (VHF) and ultra-high frequency (UHF) radios, global positioning system (GPS), a navtex, and an anemometer. The vessels will be powered by two MTU main engines developing a total power output of 3,260bkW at 2,000rpm. Each engine is coupled to a fixed-pitch propeller through a Reintjes gearbox. The engine room will be equipped with a fire-fighting system. The propeller tunnels will be integrated into the aft running surface to achieve improved performance as well as reduced draft, noise and vibration. The shipboard power will be supplied by generator sets and the propulsion system will provide a speed of 28kt. This project forms part of our recent analysis and forecasts of the global Naval Surface Combatants & Warfare Systems market available from our business information platform Strategic Defence Intelligence. For more information click here or contact us: EMEA: +44 20 7936 6783; Americas: +1 415 439 4914; Asia Pacific: +61 2 9947 9709, or via email. The 35-SPC has a carbon fibre reinforced all-composite construction, as well as navionics including a wide area augmentation system (WAAS) GPS, and a 4KW radar. Overall length of the 44-FSR is 14.42m, and its maximum speed at full load is 63.29mph.